Finches are known for their melodic song, and although they don't generally like handling, they are interesting birds to raise in captivity. Wire cages are available at a variety of price points, but if you have an afternoon to spare, it is possible to construct your own. Before you begin, you'll need to gather your materials and tools, both of which can be purchased at most home improvement stores. 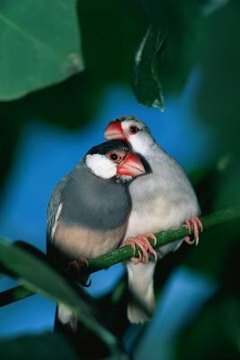 Small finches will do fine in a cage measuring 18 inches tall by 18 inches wide. Using the wire cutters, cut your panels accordingly. You'll need six panels and a small scrap piece of approximately 5 by 5 inches for the door. File off any rough edges using the metal file. If the wire is bent, pound it out with a rubber mallet. This can be accomplished by laying the panels on a flat surface, such as a piece of plywood. Lay the back flat, then attach the two sides, using the electrical ties. Set the cage upright and add the front, top and bottom. The electrical ties should be approximately 3 inches apart. Trim the ties to avoid giving your finch a plastic snack. In the front panel, cut a small square for the door. A 4-by-4-inch square should be suitable. Cut a slightly larger square from remaining wire for the door. File the door panel and entryway to avoid injury. Attach the right side of the door with electrical ties. A small tension spring can be used to fasten the door closed.  Creating a second bottom to your cage will allow you to slip a newspaper or tray into the bottom of the cage to collect droppings. ⚠ Avoid using galvanized wire, as the zinc particles may cause harm to your finches. ⚠ Keep sharp wire and tools away from children.